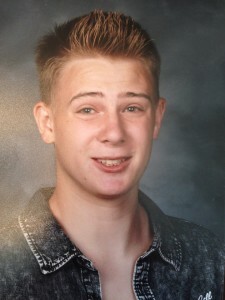 ST. GEORGE — On Sept. 1, 17-year-old Macin Smith mysteriously vanished. No trace has been turned up of his whereabouts, so his family along with a search and rescue team out of Las Vegas are organizing a search. Volunteers are needed and are asked to meet Saturday morning at the The Church of Jesus Christ of Latter-day Saints chapel at 2668 Crimson Ridge Drive in the Little Valley area of St. George. Meeting time is 6 a.m. and participants are asked to bring hydration and two-way radios, if they have them. The search will be directed by Red Rock Search and Rescue from Las Vegas, who spent Friday morning with the Smith family. Arrangements were made and plans finalized for Saturday’s search. There were reports that Macin Smith had been seen hitchhiking to Las Vegas. Tracey Smith is not discounting those reports, as one of them came from a friend. Macin Smith’s new school portrait, St. George, Utah, undated | Photo courtesy of Tracey Smith, St. George News. A Facebook page has been set up to help coordinate efforts in the search. 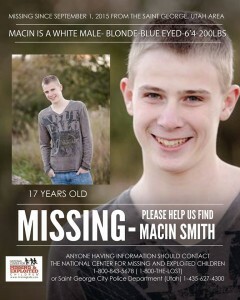 The page is called Help Find Macin Smith and as of 1 p.m. Friday the page had over 1,400 members. I keep my eye out every moment of every day. I hope he’s found soon. This truly hurts my heart. I have a son the same age and you can’t always tell how these teens are feeling inside. I would be devastated to find a note like that from my son. I wish I were physically able to help search this weekend, but I am not able to at this time. My thoughts and prayers go out to the family, as well as all those searching. I am very saddened to hear this new information. To the mom: I am unable to look for him this weekend, the most I can do is pray and you got prayers from my whole family, in Jesus name Amen!